Valentine is a relatively small cat but that does not stop her from being the rambunctious ball of fluff she is. She is very loving and comes running to meet her foster family when they come home. She is cat, dog, and kid friendly and would do great in any home. She has a friendly reaction to new people and is very affectionate. Weighing in at only 7.5 pounds Valentine is on the lower end of the average cat weight range. However small, she is healthy. She is approximately one year old and was rescued as a local stray. Even when she first came to Secondhand Hounds she was friendly and loving to volunteers that met her during her transition to her foster home. Valentine is a very playful and energetic cat that would love someone that could play with her, though she would be fine as long as she had some toys of her own to play with. 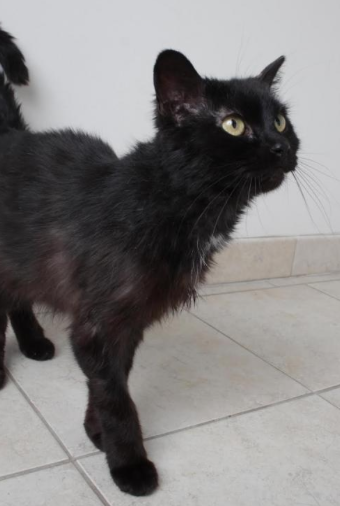 Valentine’s beautiful mostly black coat comes with a moderate amount of shedding, but since it is dark it is harder to notice. Since Secondhand Hounds does not declaw cats in their care Valentine still has hers. Secondhand Hounds strongly discourages declawing cats. The declawing of a cat can make their behaviors worse and cause long-lasting physical problems for the animal. On the bottom of the page for all of their adoptable cats they link to articles describing their reasoning for the declawing of cats unless it is needed for medical reasons. Overall, Valentine is a very sweet and loving girl who loves to be played with. She would fit into almost any home as long as they can find the time to play with her. She is spayed and is not declawed. Her adoption fee is set at $150 and she can be found on the Secondhand Hounds website under the adopt tab in the cats for adoption. All information about adoption from Secondhand Hounds can also be found in the adopt tab under how to adopt.